The argan tree is found almost exclusively in Morocco. It covers about 800 000 hectares of land and is at the peak of a harmonious ecosystem. Argan oil is a huge part of Moroccan ancestry, and has been used for centuries. Argan oil is a true elixir for dry to very dry skin as it nourishes, mitigating wrinkles and signs of aging without leaving a greasy film on the skin but a nice satin finish. It also acts on the healing of scars left by acne, chicken pox, chapping, burns and helps to decrease the appearance of stretch marks. Culinary argan oil is mainly used in slow-cooked dishes, salads, and should not be heated to high temperature to keep its properties. 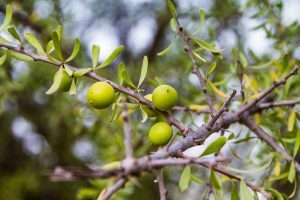 Culinary argan oil is rich in unsaturated fatty acids and vitamin E, which gives it comparable dietary qualities of olive oil. It is known for its cholesterol-lowering properties, stimulating the liver and brain cells, and protective connective tissue. Cosmetic Argan oil is organic and rich in linoleic acid, which gives it anti disinfectant properties which have been demonstrated in recent studies, thus providing a real skin softening action. 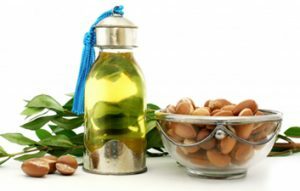 Culinary argan oil is recommended in the diet of people at risk of atherosclerosis. Cosmetic Argan oil, is recommended for all dry skin or treatment of burns and chapping. As a hair mask it will strengthen and soften hair.